Published: Aug. 29, 2017 at 01:32 p.m. Updated: Aug. 29, 2017 at 02:25 p.m. There's a lot of excitement surrounding the talented college QBs suiting up this fall. In fact, some are calling 2017 "The Year of the QB". Will we see at least six signal-callers picked in the first two rounds of the 2018 NFL Draft? Now, we don't know when these underclassmen will decide to enter the draft, but young QBs like Sam Darnold (USC), Josh Allen (Wyoming), and Lamar Jackson (Louisville) showed great promise in 2016. Josh Rosen (UCLA) struggled a bit in his sophomore campaign, but his talent is undeniable. Drew Lock (Missouri) and Jarrett Stidham (Auburn) are two young SEC QBs to watch. Throw in other players like Jake Browning (Washington) and Nick Fitzgerald (Mississippi State), and the future is bright at the position. With that in mind, I decided to look back at some of the greatest QB draft classes to rank my top five of all-time. 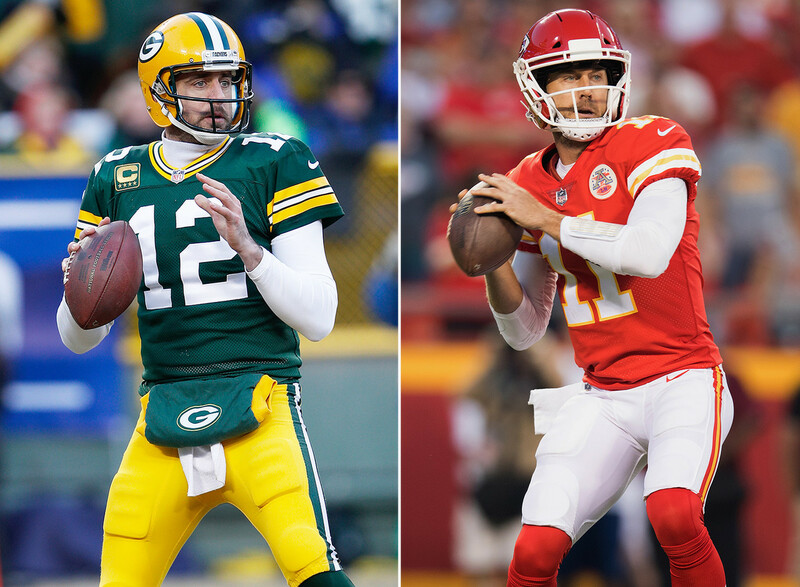 Other than Rodgers, who became one of the best quarterbacks in league history after sliding to the 24th overall pick in 2005, there isn't a lot of "wow" in this class. However, only two other classes have produced as many four-year starters as this one (six; 1971 had seven, 1987 also had six). Smith carried over the success he had late in his career with the Niners to Kansas City, becoming one of the more consistent starters in the league since 2011. Fitzpatrick's interceptions have been a bugaboo, but starting a majority of games in nine NFL seasons as a former seventh-round pick is a major accomplishment. He's now a backup for the Bucs. Campbell, Orton, and Anderson all flashed as starters -- Anderson is still kicking around the league as a reliable veteran backup for Cam Newton in Carolina. Dawson started only one game in three years with the Steelers, but soon found success in the AFL with the Dallas Texans/Kansas City Chiefs. The Texans won the AFL title in 1962, and the Chiefs went to two Super Bowls under his command, winning one. Jurgensen led the NFL in attempts, completions and yards three times between 1966 and 1969. While Kemp was selected late in the 1957 NFL Draft, his success came later, as he led the Buffalo Bills to four AFL title games, winning two. Brodie was one of the best passers in the NFL, leading the league in passing yards three times from 1965-1970. Plum was an efficient passer for the Browns from 1958 to 1961 before heading to Detroit for five marginal campaigns. This class doesn't have any Pro Football Hall of Fame QBs, but it's the only class with seven QBs that started for four or more seasons. Theismann was a two-time all-star in the CFL before signing with the Redskins to be a backup quarterback and the team's punt returner. He's best known for his play behind Washington's offensive line ("The Hogs") from 1982 to 1985, winning a title before suffering a career-ending broken leg at the hands of Lawrence Taylor. Manning never got to play on a winning team during his 15-year career, but helped the Saints reach respectability in the 1978-1979 seasons. Plunkett brought two Super Bowl titles to Oakland. In 1980, Green Bay traded another older quarterback, John Hadl, as well as cornerback Ken Ellis and two mid-round picks to Houston for Dickey. That move worked out well for the Packers as the team had one of the league's best offenses in the 1980s. At least two of these passers will head to Canton, potentially three if Rivers can build his resume with postseason success at the tail end of his career. Having already won two titles, Big Ben and the Steelers could add another before his career is over. The Miami (Ohio) alum is already in or near the top 10 of several career passing categories -- a place where Manning already resides (seventh in touchdowns, attempts, completions; eighth in yards). He and Rivers were traded for each other on draft day after his family made clear their intentions not to play for the Chargers organization. The move turned out to be good for both teams, though Manning's two Super Bowl championships give the New York the edge in that deal. Schaub was a solid starter for a few years in Houston after being traded there by Atlanta (who had Michael Vick at the time). He's now back with the Falcons as Matt Ryan's backup. Everyone knew this group would be special, but they defined success in the 1990s. This is the only class to have three of its passers voted into the Pro Football Hall of Fame (Jim Finks of the 1948 class was a quarterback, but is a Hall of Famer as an administrator, not a player like classmates Norm Van Brocklin and George Blanda). The class as a whole won nearly 59 percent of its starts -- the second-best mark among classes since the merger (second only because of Tom Brady). Elway's career went from very good to great with the help of running back Terrell Davis, winning two Super Bowls before sailing off into retirement. Kelly's ability to run the K-Gun offense with precision led the Bills to four straight Super Bowls, a great accomplishment that will be extremely difficult to match in the salary cap era. Marino set many NFL passing records with one of the quickest releases scouts have ever seen.